Feel Good Winter Wardrobe Swaps - Hej Doll | Simple modern living by Jessica Doll. Ever since I started a quest to make my closet “feel good”, I’ve been much more conscious of my shopping habits. One of the ways I’ve been more conscious is to look for a feel good alternative when I fall in love with something I know may not feel good to buy. Here are a few of my favorite winter items, as well as their feel good alternative to consider. If you like the Madewell Province Cross-Back Sweater, try the Cuyana Ribbed Open-Back Sweater. It’s made from higher quality fabrics and features the same beautiful cross-back design. If you like the Madewell Cashmere Sweatshirt, try the Everlane Cashmere Crew. Not only is it a better price, they have a clearer supply chain. If you like the Madewell Slit-sleeve Turtleneck Sweater, try the Everlane Ribbed Oversized Turtleneck. Not only is it lower in price, their supply chain is more transparent. 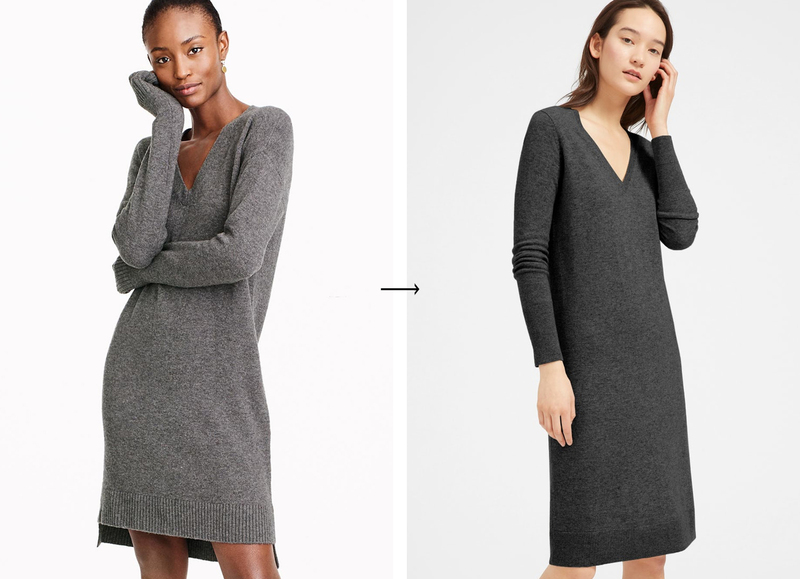 If you love the Madewell Long-Sleeve Sweater Dress, try the Everlane Cashmere V-Neck Midi Dress. It is made from 100% cashmere, a pure fabric. If you like the Madewell Rivington Sweater Coat, try the Cuyana Reversible Knitted Coat. While both are made from whole materials, Cuyana’s is reversible and made by artisans paid a living wage in Peru. If you like the RRD Padded Long-Line Coat, try the Carve Designs Davos Jacket. The filling is traceable, featuring cruelty-free 90/10 recycled goose down. Carve sent it to me to try out this winter, so I can also vet that it is warm and snuggly. Sizing is true to size (I wear a small) and I have no problem wearing a sweater under it. If you like the J.Crew 2011 Foundry Pant, try the Everlane Wide Leg Crop Pant. While they are both made from cotton, Everlane has a more transparent supply chain. If you like the J.Crew New Easy Pant, try the Everlane Go-Weave Easy Pant. The Everlane pants are made from 100% wrinkle-resistant wool. If you like the Madewell 10″ high-rise skinny jeans, try the Everlane High-Rise Skinny Jean. They have a higher cotton content with just enough stretch to make you feel comfortably “pulled-in”. If you like the Gucci Princetown Loafer Mule, try Everlane Modern Tassel Loafer Mule. Or if the tassels aren’t your thing, the modern penny loafer mule is beautiful as well. If you like the Acne Jensen Pointy Toe Bootie, try the Everlane Boss Boot. While Acne seems to have a transparent supply chain, it’s difficult to follow on their website. Plus I can recommend the Everlane Boss Boots with 2 thumbs up, I own them! What pieces are you looking to add to your wardrobe? Would you consider something more “feel good” instead? These looks are so awesome! I’ve been meaning to breathe some new life into my winter wardrobe. Thanks! This is awesome! I love when you can recreate fashion outfits at a cheaper price! These are some great products! So many stylish swap ideas! I am a sucker for oversized sweaters and long knitted coats during the winter. These are gorgeous winter outfits. I love those black booties. I recently ordered similar booties and am in love with them. I wear them several times per week. More of this please! Love it! I am in love with your choices! The black sweater with the crossed back is my absolute favorite! Great cozy winter clothes! This is awesome – I was just looking to replace my winter coat and I love that Carve Designs look. These are great choices! basic, comfortable and chic style. casual yet classy. Those are all great choices! A lot of times, I see wardrobe suggestions and they are all impractical for my lifestyle. But these are all so cozy and comfy! I live in Upstate NY and the winters here are long and cold, so I’m all for warm! Living in FL, we don’t really need a winter wardrobe but I love the options you’ve put together. They are perfect! I am all about feel good over fashionable although sometimes I have been lucky enough to find a combo. I love being comfy while looking good, it’s the best. Those are some really cute similar choices. When I see an outfit I like, I try to find similar in the least amount possible. I’m on a serious budget. Oh I love all of these. So luxe looking. These are beautiful wardrobe suggestions. I love every one of them. very good collection, beauty full suggestions, thank you. beauty full suggestions, thank you.